Arguably the biggest star to emerge from the 2010 World Cup, Paul the Psychic Octopus garnered every bit as much attention and adoration as the athletes on the soccer field. The octopus first drew attention among local fans in his hometown of Oberhausen, Germany, when his feeding habits were turned into a soccer-predicting event. Two boxes were placed in Paul's tank, each containing a tasty mussel and each labeled with a photograph of the competitors in an upcoming match. Whichever team's box Paul chose to open at dinner time became his game time prediction. After he correctly predicted the winner of each of Germany's World Cup matches  seven in all  the world at large began to embrace his psychic prowess. After Germany was eliminated, he went on to predict that Spain would trounce the Netherlands  another correct pick that gave Paul a flawless record. Of course, you can't mess with something as beloved as the World Cup without rousing a little hatred. German fans issued death threats (paella of octopus, anyone?) when Paul failed to select them to win in the semifinal. 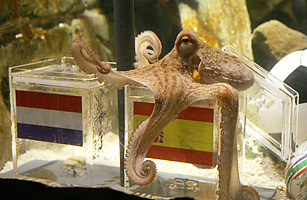 After the World Cup it was announced that he was retiring from sports predictions and on October 26, 2010 the great Paul the Octopus passed away ... only to be resurrected hours later by the installing of another soccer-predicting squid  named Paul.